This was a book that I had sort of attempted before. Back when I was in high school, I used to read to my mum while she did the ironing. 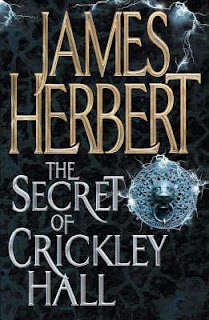 We got through all sorts like that, and I had picked up The Secret of Crickley Hall in the hopes that I could read it to her. We read a couple chapters and then put it down because she thought it would be too scary for me. Now I picked this book up because there is a part of me that really likes the haunted house genre of horror. Problem is that it's quite difficult to get good examples of it these days. Is this yet another disappointment? The plot follows the Caleigh family as they move temporarily to the remote Devonshire village of Hollow Bay. It is coming up to the first anniversary of the disappearance of their middle child, Cam, and the husband hopes that a change of scenery will be good for himself and his two daughters, but especially for his wife who has been blaming herself for her child's disappearance. But the house that they are renting, the eponymous Crickley Hall, has a dark past that refuses to stay quiet. There is something wrong with the house and if they don't figure out what it is in time, then evil from the past may well repeat itself. I'm somewhat torn on whether I think this is well written or not. On the one hand, the plot is well constructed and it does manage to be incredibly tense and uncomfortable for a good chunk of the book. Additionally, the awful events that unfolded in the Hall during the Second World War are genuinely traumatic enough to warrant multiple spirits with unfinished business, which is nice after some haunted house stories where the past trauma really isn't all that exciting. On the other hand, Herbert has a tendency to repeat himself quite a bit, often echoing certain phrases over and over despite the fact that different people are saying or thinking it each time. One of the main examples is the married couple, Gabe and Eve, and their contrasting ways of coping with their son's disappearance. Eve is on the verge of a nervous breakdown but keeps it at bay by refusing to believe that her little boy could be dead, while Gabe just locks it all away and puts on a brave face. When in their respective viewpoints, they consider their own coping strategies, which is fine if a little wordy. But then they consider their partner's coping method and come up with almost identical thinking processes. I don't need to know that Eve knows that Gabe is putting on a brave face for her, I've already had confirmation from him. It makes it feel like there were whole chunks of narrative that went unchanged during the editing process because they sound amateur, quite frankly. Additionally, I just don't think that the Caleigh family are all that interesting. They also seem to have a weird habit of continuing their domestic dramas even when the hauntings become increasingly more unnerving. I can understand that characters will have their own personal concerns, but when they seem to practically forget the fact that their house is full of unexplained phenomena in favour of the eldest daughter's troubles with a school bully, then it seems a little like their priorities are wildly out of sync with the reader's. So a bit of a mixed bag, but when Herbert knuckles down to the actual creepy stuff, then boy does he get it right.